Your dog may be a voracious chewer, but this ball, developed for use with lions, tigers & bears, can take on the hardest players of them all. 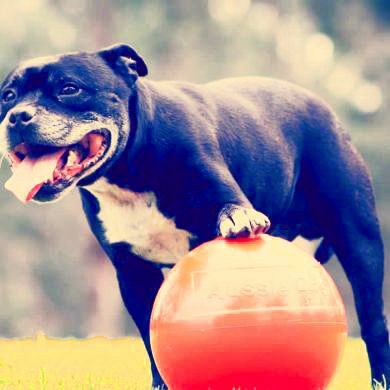 Staffies and Staffie X breeds have a rock solid reputation for toy destruction and this ball is made to stand up to them - or any destructive dog in the 30 - 50+ kg range. Even the bite force of a lion can not crush this ball! That’s saying something. 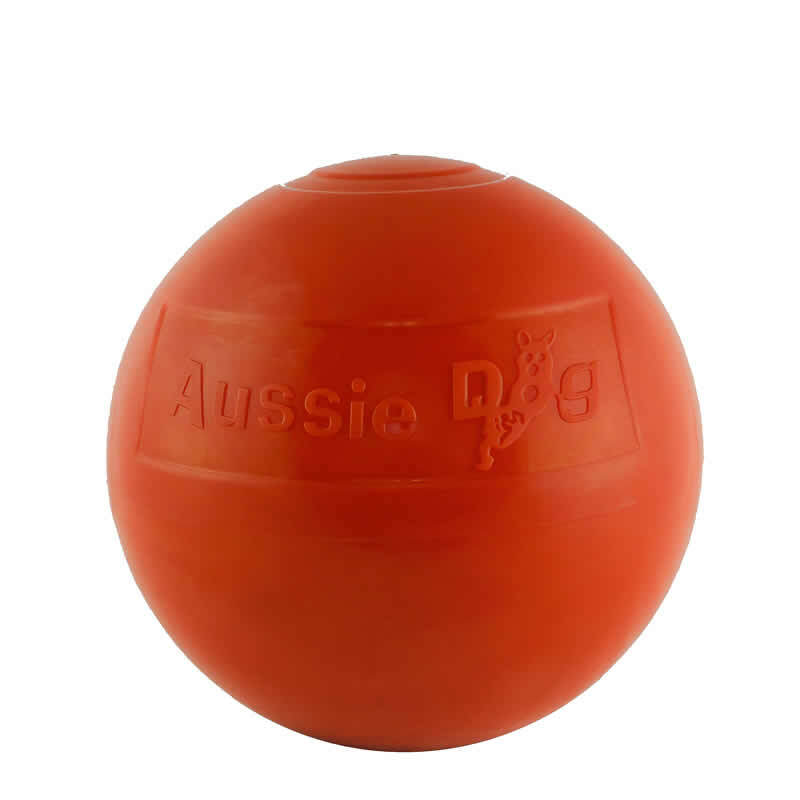 The 24 cm diameter of the ball prevents dogs from getting enough mouth leverage to bite into it. If it becomes rough over time you can just sand it smooth again. 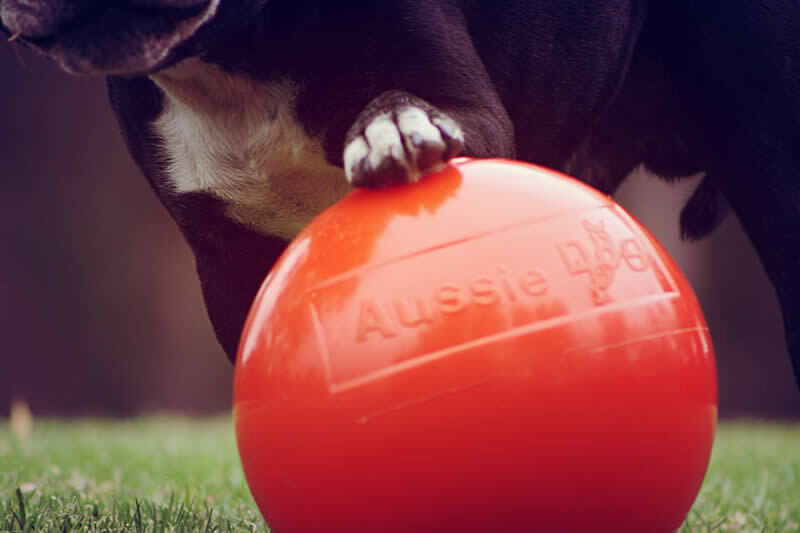 Read 7 customer reviews of Aussie Dog Staffie Ball. The average customer rating is 3.7. Ned is an Aussie Bulldog. He showed me he knows how to push the ball with his nose and guide it across the grass with his paws and chest. He seemed to enjoy it. Then the heatwave started and he's not shown much interest since. I'm hoping that with cooler weather he'll feel like playing staffie-ball soccer with me. 2 German Shepherds are amused for hours . Our dog loves it. It is lighter than the equivalent "rubber" ball we bought and therefore much easier to use. As it is completely smooth all round she has nothing to grab onto and bight which is a bad habit of hers. She destroys most play things by chewing if she can get a purchase, The internal rattle keeps her amused. 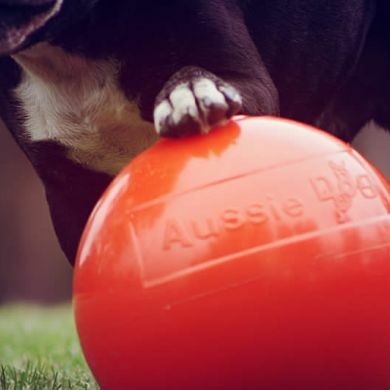 Our Staffies were always chewing up balls , didn't matter what type of ball we got they still would destroy the ball.We got a Aussie Dog Staffie ball each they are great they play for ages with them .They are a great product would recommend them to anyone. Not a success for us. The Staffy ball is certainly tough, however my 1 year old Staffy got sooo frustrated with it because he couldn't gain purchase on it. He was more than determined to keep trying and I ended up worried that he would either break his teeth or dislocate his jaw so I had to take it away from him. I was also quite surprised that he actually growled at me when I tried to bat the ball away, such was his frustration! He's never displayed this kind of behaviour with other toys that we have played with together. He did manage to put some grooves in the ball but I think his jaw/teeth would have given out in the end. Maybe for when he's older? This ball is terrible!!!!! 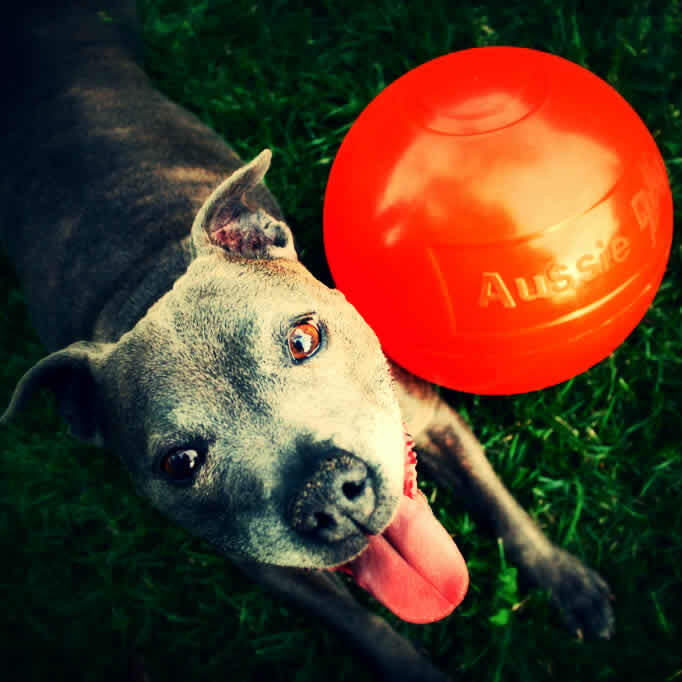 Should have brought a bowling ball , our English staffy hates it....too hard and no fun for her at all . The ball just sits in our garage .